With regards to the ensuite in the front of the van, yes we have done it. But, there is a serious drawback you could not be expected to know about. With full standing headroom up in the front of the van, you are SERIOUSLY reducing the aerodynamic rake on the Bushtracker. Now that means that you will be pushing more wind, with half the rake, and this can reduce your fuel economy and power by as much as 20%. This aerodynamic rake affect, is the part of the van above the tow vehicle, and particularly bucking a headwind this is a fairly dramatic difference that can reduce power and increase fuel economy noticeably. With all things possible, we will do it your way, but not until we make you aware of the disadvantages involved. 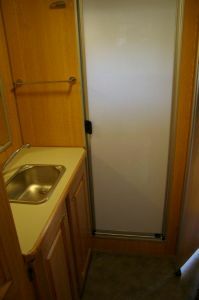 Ensuite in the back of the van: We can do it with cabinetry over the Departure Angle, but some people want to eliminate the Departure Angle to get the shower and such right out at the back of the van. The departure angle in the back is probably a little more important than you might be thinking. It not just so that you don't drag out the back corner of the van when you go up a step bank, it is even more important so you can back the van up a steep bank. Sometime, when you have gone down a wrong track, you might find the need to do a three point turn to get you out of trouble instead of trying to back out the whole way. The departure angle allows the rear of the van to overhang a steep bank long enough for the wheels to start lifting the van, allowing you to back up a steep bank or hill or grading, so you can do that three point turn around. In summary, the departure angle rake in the back, is necessary for backing up a steep bank in reverse or going up a steep bank in forward without dragging out the back of the van..... And is pretty important. Ensuite mid ships layout, over the wheel boxes: This now works, and is a very popular layout style. It works well now because of the introduction of the Vacuflush loo system where the canister can be remote mounted somewhere else, instead of needing to have access right out the side where the wheel box would be in the way. This works very well, with sink and cabinetry over the wheel box, with the wheel box built into that cabinetry; and loo and shower inside of that. It does give a unique feeling to the van of "rooms"� rather than the "open plan". In this "rooms" feel, it works with the bedroom up forward, then the ensuite/ dressing area and lockers, then the galley, and usually dining area out the back end. The only real disadvantage other than the style of "rooms" instead of an "open" plan, is that this layout does seem to add about 100kg to 150 kg to the weight of the van. Extra bulkheads, cabinetry, it just is there and you need to be aware that there is a weight penalty. A 20' with about 400kg of Optional Equipment on board, where it could come in closer to 2500kg to 2550 kg, was just weighed at 2660 kg with that layout. Pretty true to form. Ensuite in the rear of the van behind the wheel box but in front of the departure angle: This is our most common plan. 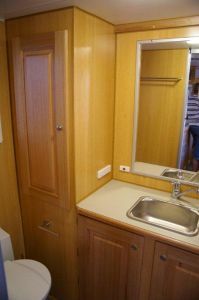 Over the Departure Angle is usually a bunk, or bunks, or cabinetry, or cabinets.. Most commonly in the rear is cabinets below, bench top and overhead cabinets, and a pantry just inside the door in the corner. This plan style is an "open" plan, and is the most popular and probably the most efficient layout. I hope this is helping. I will try and add some layout samples to illustrate what I am talking about, later. You can always refer to the Layout Samples on our Website at www.bushtracker.com to understand this a bit better. It is the Layout of the season this year... We have found a way to do this and still keep the all important departure angle, and it has been AMAZINGLY popular this year.. But this one has been a hit all year, everyong seems to LOVE it...! The shower is still one piece, hand laid up fibreglass, like no one else builds. This is hand laid up in resin and matt and gelcoat, to suit your layout choices. This is just one style of countless possibilities.. Thanks for a great forum, we have ordered our 20ft Bushtracker and are approaching the design stage the only decision we are yet to make is wether to go for a combined toilet/shower midway or the full ensuite across the rear which seems to be popular, we can see advantages /disadvantages to both but would appreciate any feedback from you or owners.We realise it will probably come down to personal choice in the end but others experiences are of great value. Look, let me explain the advantages and disadvantages as I hear from hundreds of Owners per year. I am unique in that I am not necessary subject to my own likes and dislikes, and can be more objective than just personal preferences. Why? How? It is simply because I am the hub of the wheel, the information highway for the thousands, and the information crosses with me.. I try and not give personal opinions, rather reflect the overall average viewpoints in terms of pros and cons. That makes my advice very valid, so here goes.. The separate toilet and shower arrangement is HUGELY popular for the dressing room in between. 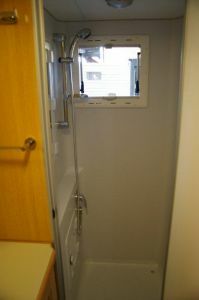 This allows for privacy, in process, shower and makeup or normal things like that. The vanity in between, drawers and storage, but mostly a dressing room in privacy in and out of the shower...Yes there is a dual function as well, as someone could use the loo while someone is having a shower, but the privacy and dressing room and nice vanity and storage is the main advantage. 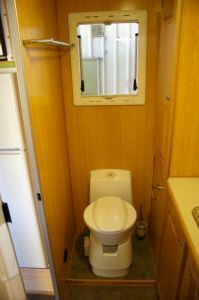 The combined toilet and show is very space efficient, particularly if you needed bunks or something else that requires the extra room.. This is particularly true with family layouts. If not, then there are disadvantages to overcome. It is a bit inconvenient for getting undressed and dressed again. Further I hear the Ladies complaints about a wet toilet seat. Now this can be handled a few different ways, like putting a small kitchen white small trash can lid over it, and other ways like shower curtain, or just wipe it down. If you needed the space for some other layout requirements then this is a really good option. If not, then the vast majority would go for the luxury of the full rear ensuite. The other consideration is resale. 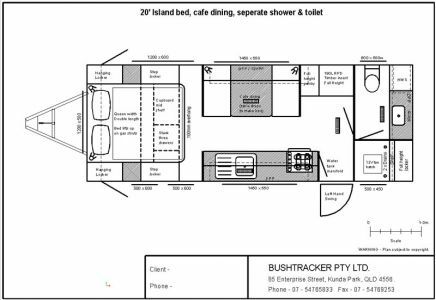 The full rear ensuite and dressing room and vanity is one of the main reasons people upgrade from an older style Bushtrackers. It would certainly be more marketable. HI Steve, this is Paula, thanks for your reply, there is another decision we are having to make as well, it concerns the over bed hatch.. Graeme didn't mention we will be living full-time in our van, and I am concerned about the light rather than the heat it will let into the bedroom..I must add we are both shift workers and have been used to a darkened room. I'm wondering what advice you have and I would love to hear any comments from other full-timers as well..
Hi Lew, thanks for your reply, will take your advice..
Hello Paula again, one more question without becoming a pest, it concerns the dining table, wether to go with the cafe or 'U' shape..keeping in mind full-time living..I think the 'u' shape would be more comfortable though the cafe style more practical..we will both be using the table for our computers, watching TV etc. . My concern is the power points, where they would be with the 'U' seating?